Food truck street food has become quite the culinary trend across the country; in Fayetteville, it is no different. Local residents appreciate the thriving small and local business scene and especially support groups offering new and exciting food options. 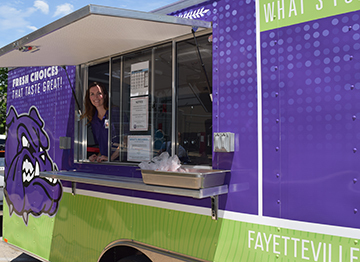 Last summer, Fayetteville Public Schools expanded its mobile feeding program by unveiling the Child Nutrition Department food truck to serve free meals and snacks to anyone 18 years or younger. The bulldog-themed, retro-fitted cargo trailer created a buzz with kids, families, and the community at large and increased participation in the free meal program by 25%. To continue the excitement into the school year, the FPS Food Truck will be touring secondary schools across the district in October and in the spring of 2019 as part of the Food Truck Dayz lunch series. Any student can order their school lunch from the street food menu that will feature 100% all beef sliders, a vegetarian option, and various picnic-style sides. Teachers and staff are encouraged to eat school lunch on that day as well, and all can enjoy eating their lunch outside. Local foods will be utilized as available for the mobile salad bar by the FPS Seed to Student program. Parents/guardians who would like to eat the food truck meal with their student should ask the school’s front office in advance whether guests are invited to attend. The cost for a guest meal is $3.60 and can be paid the day of the event. See below for the Food Truck Dayz schedule.